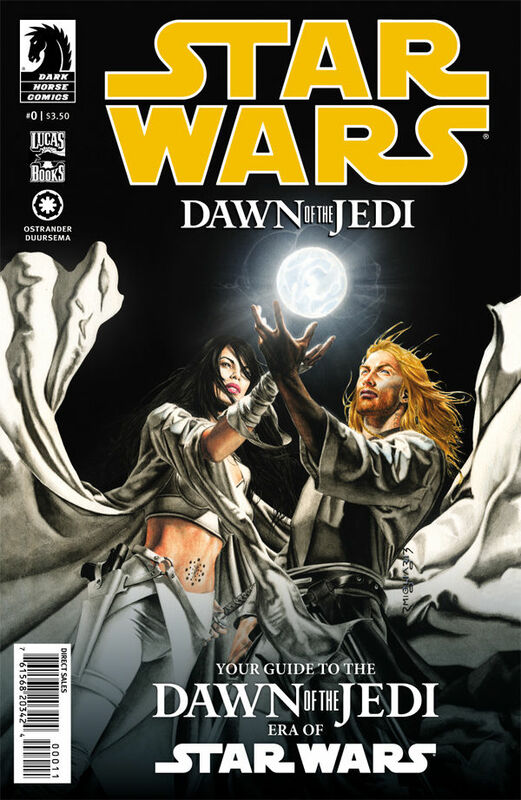 The Fellowship was fortunate enough to obtain a copy of STAR WARS: DAWN OF THE JEDI #0 from Dark Horse Comics. The text is by John Ostrander with the art by Jan Duursema and cover by Rodolfo Migliari. STAR WARS: DAWN OF THE JEDI #0 is a guide for the reader in preparedness for the upcoming miniseries. It examines the worlds, vehicles, locations, races, events and characters that will be in or referenced to the upcoming story. I found it interesting the different temples that catered to a particular aspect of the Force (e.g. science, healing arts, physical manifestations, etc). Even the word origin of Jedi is explained here. It comes from the word Je’daii, an amalgam of two Dai Bendu words: je, meaning “mystic,” and daii, meaning “center.” The Je’daii code is here as well as the level of attainments, from Padawan to Temple Master. Ostrander and Duursema are no strangers to the STAR WARS, most recently worked on STAR WARS: LEGACY (highly recommended) and its follow-up mini-series, STAR WARS: LEGACY: WAR. They are such a great team and seem at home here in the galaxy far, far away. I love reading these guides/database books and this is one of the better ones. STAR WARS: DAWN OF THE JEDI #0 is out in stores now or available at www.darkhorse.com.